TFP is your source for quality chrome and stainless steel trim. TFP puts great pride into the construction of their Chrome Tailgate Handles to offer a high quality chrome look and feel, but still in OEM style. They are made of high quality ABS (just like OEM) that has been chromed, at a fraction of the cost of billet. TFP offers a full 3 year replacement warranty. You can feel confident that these are not just another product that looks good but a product that will perform. 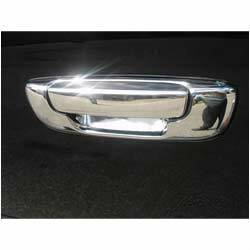 TFP Chrome Tailgate Handles are a high quality product that looks great and will last.